A Tonk's Tail... err, Tale...: Yesterday was Boxing Day! And a bootiful box with a bootiful kitty in it too! Now that's a great picture, Allie. SOMEBODY got some New Balance sneakers for Christmas! My Dad LOVES his. We were late, too, but being in a box is the best no matter what day it is. I thought the sport, so I pounded my little sis a few times...your take is much more relaxing! It is amazing how comfortable Allie can make a box look! Allie, we know it was your human's fault. 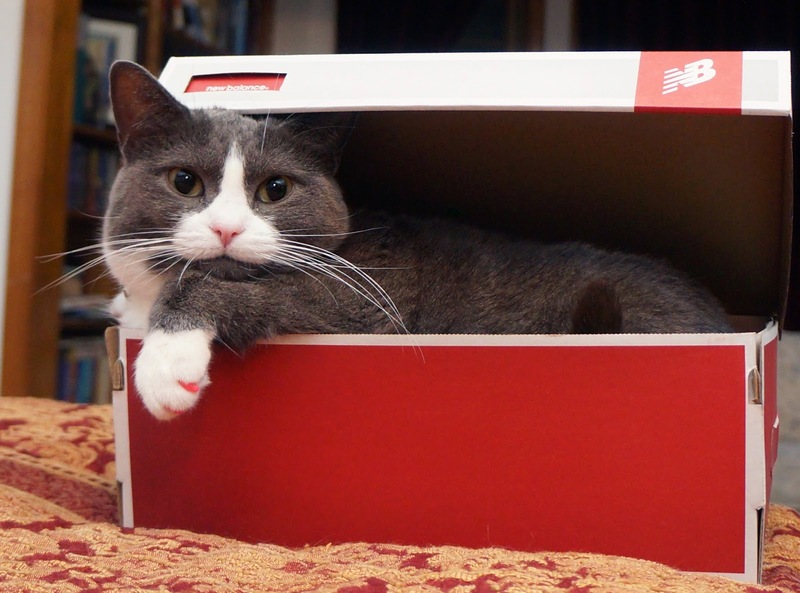 Sherpa's favorite box is a New Balance Box! When you're a cat, every day is boxing day! You maybe fashionably late, but you are gorgeous. You are making my heart beat way too fast M says. Swoon! Love your pink nails. Fashionably late and beautiful as always! You make a box look high fashion Miss Allie! You're totally rockin' that box, Allie. It was well worth the wait. That is a fantastic pic and purrfect for Boxing Day!